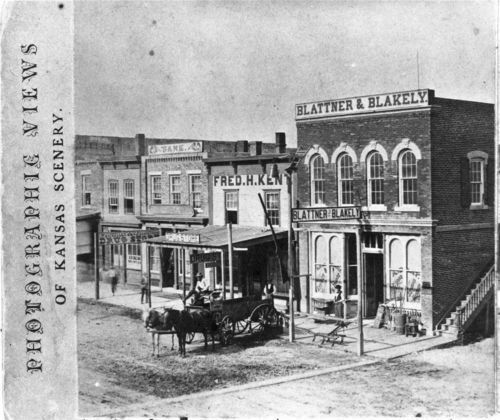 This photograph shows two drug stores next to each other on a street of business buildings in Junction City, Kansas. One sign advertises "Wholesale and Prescription Drug Store," and the other sign only reads, "Drug Store." Other businesses visible are a bank, and Blattner and Blakely. A horse-drawn wagon and a few men are visible on the street. Holding Institution: George Smith Public Library, 1975.